Are you aware of some history or do you have photos you would like to share that pertain to our neightborhood? and we can put something together for this website. I can easily scan photos and have them back to you in a couple of hours. 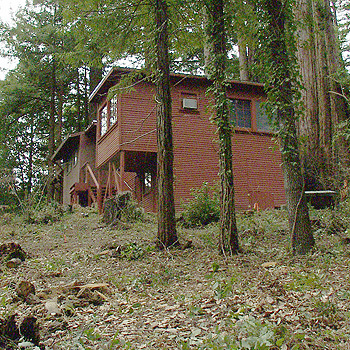 The large Redwood trees near the house were limbed up to reduce ladder fuels, and branches overhanging the roofline were removed. A few of the smaller Redwood trees were cut down. All wood waste from this clearing was chipped, and hauled offsite. The cost of this initial clearing came to about $3200.00. Allstate also wanted all the leaves and forest mulch within 30 feet of the home to be reduced to a depth of less than 3 inches, as well as an old composting pile with many years accumulation removed or at least reduced significantly. The Cozzolinos took on this task themselves, and completed it over the course of several long days' hard work. The accumulation amounted to approximately 28 cubic yards of debris which was tractor loaded, and hauled away in two dump truck loads, and one flat bed truck load. Saunders Land Service was hired for this job at a cost of $725.00. Bear in mind that this property had been under a somewhat sporadic maintenance schedule since the passing of Molly's mother, Jean Moran, many years ago. Some of the older residents of Lomond Terrace remember Jean Moran as one of the true "old-timers" on the mountain. Jean and her husband, Barney, ran an egg farm on the property beginning in the mid 1950's, and for many years supplied eggs to all the supermarkets in the San Lorenzo Valley and Scotts Valley area. As of post time for this article Allstate has returned to re-inspect the property, and happily signed off on the work, telling the Cozzolinos that they actually did more than enough to satisfy Allstate's requirements. Included in the last mailing from the Annual Meeting of Lomond Terrace Road Association was a reprinted brochure from California Department of Forestry and Fire Protection outlining State fire clearance requirements. This is a good guide to what you might also expect your insurance carrier to require as a prerequisite for issuing a new policy, or possibly even renewing your old one. This is the guide that Lenny and Molly used as a blue print for their project. Their Allstate inspector was an independent contractor who does inspections for some of the larger insurance carries in the area. Therefore, one would conclude that the work done by the Cozzolinos at 860 Valley View would satisfy the fire hazard reduction requirements of most insurance carriers in the area. Recently, the Ben Lomond Fire Protection District also mailed out a very similar brochure outlining their requirements for residential fire clearances. In addition to providing this helpful information, they indicated that they would be doing onsite inspections to enforce Public Resources Code sec. 4291, which is the authority they can claim to make home owners comply with the recommendations of the brochure. As of post time, the first of these inspections has been completed by Capt. Charlie Missman of BLFD. He is in charge of a program called L.E. 100, named after the State issued form that BLFD is using to determine if properties meet State Fire Code to a distance of 100 ft from individual residences. Capt. Missman's initial goal was to identify easily mitigated fire hazards such as accumulations of leaves on roofs, lack of fire screens on chimneys, and tree branches near chimney tops. He issued a few citations. He was also checking fire engine access, which he said was not bad for a mountain road, and indentifying water sources such as hydrants and private water tanks. In addition to this, he was looking for wood piles within 30ft of homes, and people storing belongings under their decks, which he said can be a fire hazard. His main problem during his initial inspection of Lomond Terrace was the lack of clearly marked house numbers, and some of our residents were contacted by him regarding confusing or non-existent house numbering. Capt. Missman will be returning to the neighborhood in May to re-inspect the neighborhood to see that these near-home issues have been addressed, and to begin looking to reduce fire hazard out 30ft, and on subsequent visits to the full 100ft mandated by State Fire Code. This will be an ongoing program implemented over a time period reaching into next year, and in some form as long as the trees and brush keep growing, and people choose to live in the forest. The bottom line is that fire season is upon us again. Probably best to get outside, take a look at your property and give some thought to fire safety. Whether the push comes from your insurance carrier, or your local fire department, chances are good that Lomond Terrace Residents will be asked to devote more attention to reducing their individual and collective exposure to the dangers of wild land fire.